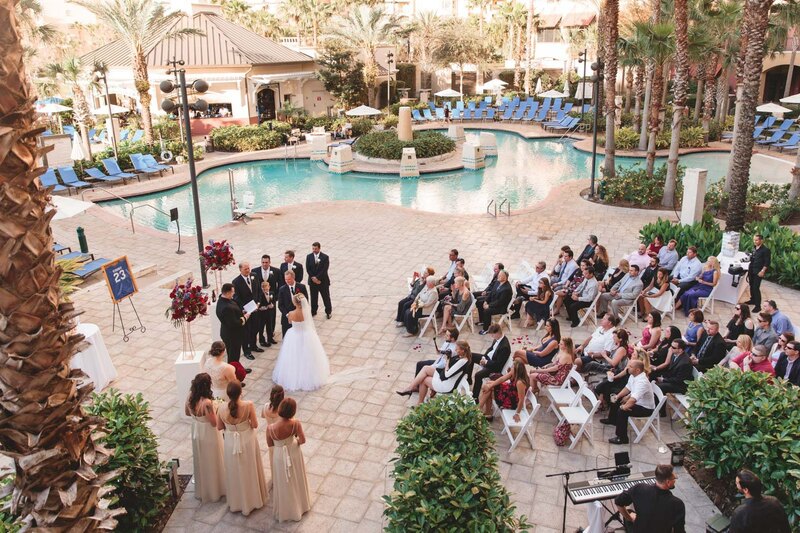 Surrounded by lush coconut palms, shimmering lakes, and idyllic Spanish-style architecture, our 500-acre Orlando lakefront property is sure to enhance your upcoming wedding, reception, commitment ceremony, or rehearsal dinner. For more information contact the sales team at (407) 390-2480 or eMail. 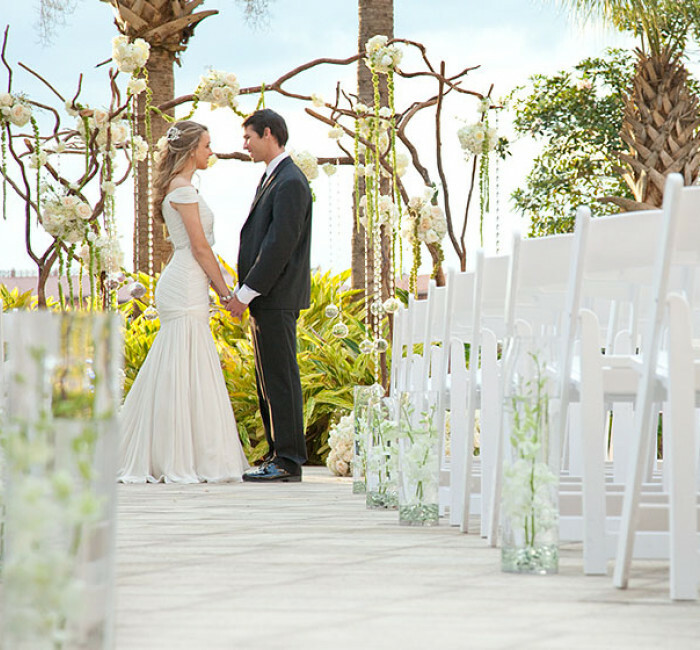 Links to resources to help plan your perfect Orlando wedding. "Francesca made everything effortless for us. We asked and she delivered with no hesitation and no delay. This woman works her tail off and should be highly rewarded for her expertise and "can do" attitude... She is organized, thorough, smart, attentive and creative. (ex: the labels with Olivia's dog on the fruit cups at breakfast made us giggle) I can't say it enough... she is AMAZING! The reception was perfect from the time we entered the ballroom until the time we left. The food was spectacular, the cake was delicious, the serving staff was attentive, and let's not forget the especially tasty sweet plantains. Bravo to everyone!" 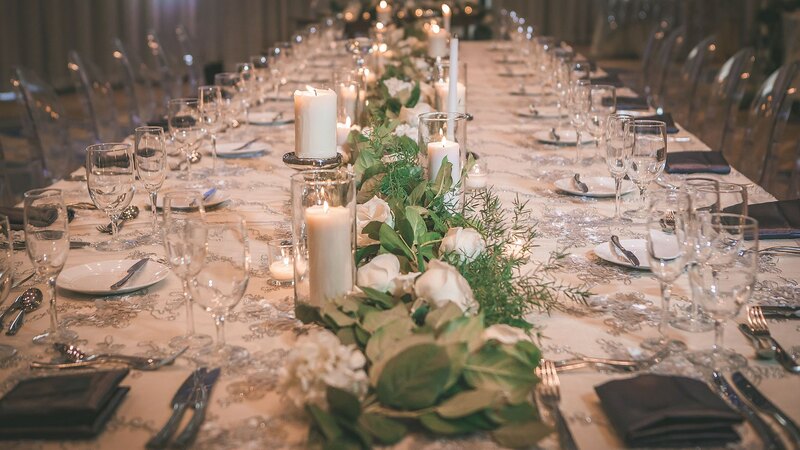 "We had the pleasure in having Francesca as our catering manager and we knew from our first site visit that this property was ‘it’ for our reception venue and loved working with Francesca. She was super accommodating and went above and beyond throughout our planning experience. 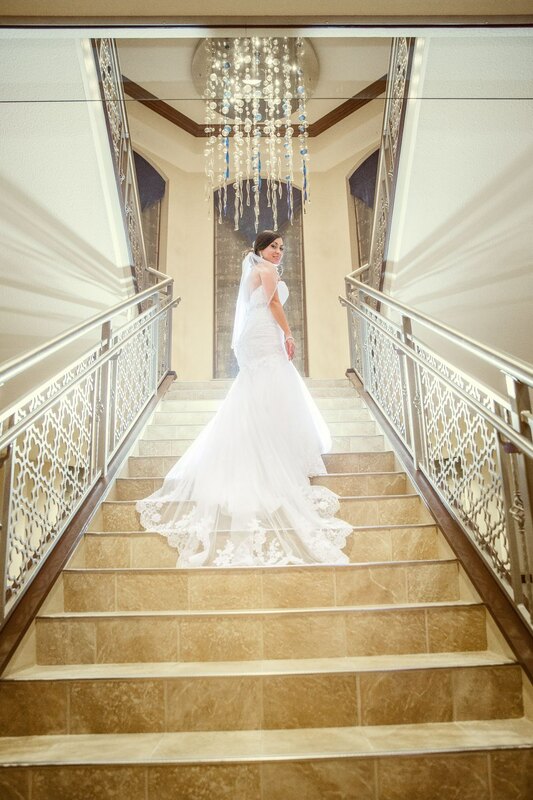 She worked directly with our wedding coordinator to ensure a smooth reception experience...The entire ambiance around the resort couldn't have been more ideal or perfect for us. Needless to say we never wanted to checkout of the resort. Thanks to the Grand for an unforgettable weekend." Choosing [this Resort] was the best decision we could have made! Our elegant Bonnet Creek Ballroom is located on the lobby level and features natural light and stunning views of the lake. 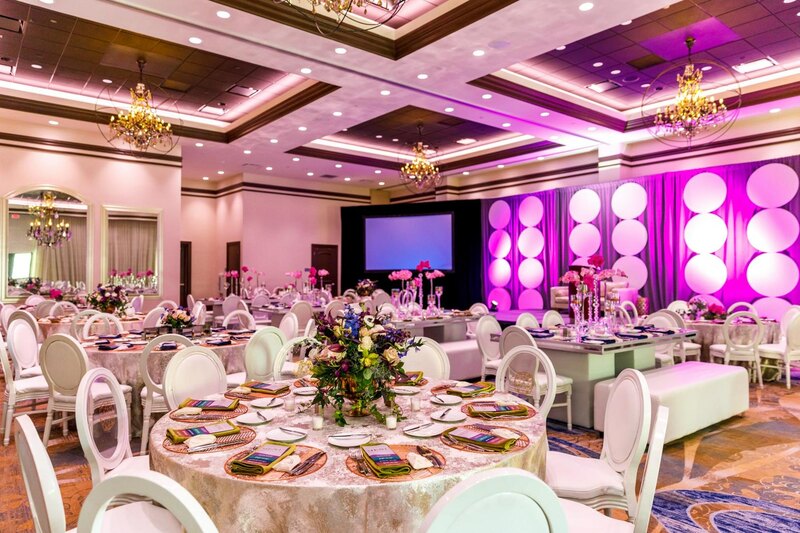 Perfect for large celebrations, the Ponce de Leon Ballroom offers incredible 19-foot ceilings, Featuring soaring 19-foot ceilings and contemporary chic design. Lined by gorgeous palm trees, our spacious Pool Deck offers a tropical setting for up to 400 friends and family members. Thoughtfully designed with an array of elegant touches and sophisticated furnishings, our 1,600-square-foot Executive Lounge is suited for up to 100 people. For distinguished rehearsal dinners, farewell brunches, and intimate gatherings, choose our contemporary and stylish private dining room. Crafting the intimate destination wedding or reception of your dreams just got easier with our special wedding packages. 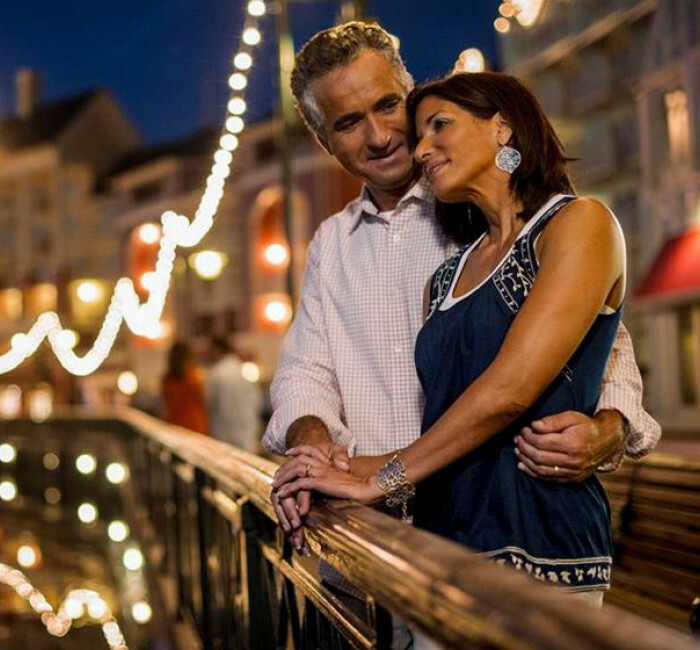 Plan an unforgettable honeymoon near Disney World®, featuring attentive service, relaxing surroundings and thoughtful touches.